Ratan Naval Tata, KBE (born 28 December 1937) is an Indian businessman who became chairman of the Tata Group (1991–2012), a Mumbai-based conglomerate. Tata is the adoptive great-grandson of Tata group founder Jamsetji Tata. His father, Naval Tata, had been adopted from the family of a distant relative by Jamsetji's childless younger son, also named Ratan Tata, and his wife Navajbai. Tata's parents (Naval and his first wife Sooni) separated in the mid-1940s when Ratan was seven and his younger brother Jimmy was five years old. Both he and his brother were raised by their grandmother Lady Navajbai. Many years later, Naval Tata took a second wife, Simone, and fathered another son, Noel Tata. Tata began his schooling in Bombay at the Campion School and the Bishop Cotton School in Shimla, and finished his secondary education at the Cathedral and John Connon School.He completed his B.S. in architecture with structural engineering from Cornell University in 1962, and the Advanced Management Program from Harvard Business School in 1975. Tata is a member of the Alpha Sigma Phi fraternity. Tata began his career in the Tata group in 1962; he initially worked on the shop floor of Tata Steel, shovelling limestone and handling the blast furnace. In 1991, J. R. D. Tata stepped down as Tata Industries chairman, naming Ratan as his successor. He was heavily criticized for lacking experience in running a company of the scale of Tata Industries. In 1991, Tata was appointed as the chairman of the Tata group. Under his stewardship, Tata Tea acquired Tetley, Tata motors acquired Jaguar Land Rover and Tata Steel acquired Corus, which have turned Tata from a largely India-centric company into a global business, with 65% revenues coming from abroad. 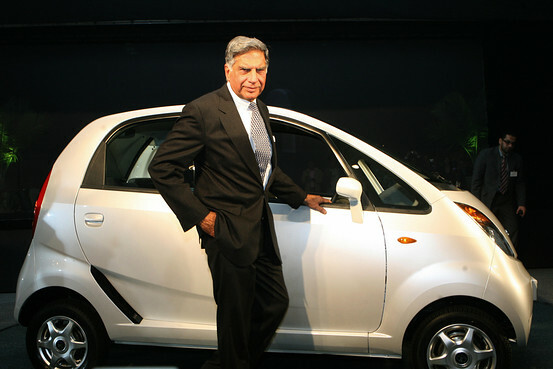 He also pushed the development of the Tata Indica and the Tata Nano. Ratan Tata retired from all executive responsibility in the Tata group in December 28th 2012 which is also his 75th birthday and he is succeeded by Cyrus Mistry, the 44-year-old son of Pallonji Mistry and managing director of Shapoorji Pallonji Group. He is currently the chairman emeritus of Tata Sons, Tata Motors and Tata Steel. He is also the chairman of the main two Tata trusts Sir Dorabji Tata and Allied Trusts and Sir Ratan Tata Trust which together hold 66% of shares in the group holding company Tata Sons. "I am deeply honoured to have received this award from an institute of such a stature," said Mr Tata. A Padma Bhushan recepient, Mr Tata has also been conferred an honorary doctorate in business administration by the Ohio State University, an honorary doctorate in technology by the Asian Institute of Technology, Bangkok, and an honorary doctorate in science by the University of Warwick. Mr Tata received a bachelor of science degree in architecture from Cornell University in 1962 and completed the advanced management program at Harvard. The citation presented to Mr Tata read, "Mr Ratan N Tata is a towering figure in the Indian engineering industry. Throughout his career in various positions in the Tata Group of Companies, he has set an unparalleled standard of excellence. With very few ever to emulate his scale of achievements, he symbolises India's entry into the global industrial map. Under his leadership, Tata Group has also emerged as one of the most respectable companies in the world, in terms of its contribution to corporate social responsibilities and philanthropy. As an individual, Mr Tata has long commitment to social uplift of the disadvantaged people." It is tempting to look at Ratan Tata, the Indian tycoon whose company last week took over Land Rover and Jaguar, as a symbol of a nation's headlong charge towards economic superpowerdom. This, we suspect, is how it tends to be with those pesky, nouveau riche Asians; one minute you've never heard of them, the next they are snaffling up all your best-known firms, and treating themselves to large, stucco-fronted mansions in Kensington. Ratan, 70, and his faintly mysterious Bombay-based family, do not fit this caricature at all. Resoundingly non-nouveau, the Tatas have moved among India's business aristocracy since Queen Victoria was on the throne, and while the last 150 years have seen a steady growth in their power, wealth and reach, the family is famed for never having done anything even remotely headlong. Yet Britain is succumbing to them. The £1 billion acquisition of two of the UK motor industry's most illustrious marques follows the £250 million purchase of Tetley tea in 2000, and last year's £6.75 billion takeover of Corus, the Anglo-Dutch steelmaking combine. All this, moreover, is likely to be a mere warm up for the big invasion Ratan appears to have in mind. The Tatas are currently involved in everything from luxury hotels to watchmaking, but while their presence is inescapable in India, they see abundant room to grow in Britain. The calm - some would say stealth - with which Ratan operates appears to be a consequence of both temperament and heritage. Sometimes described as the "Chairman of Corporate India" he is a non-drinking, non-smoking bachelor Parsee, descended from Zoroastrian priests who fled persecution in Iran more than 1,000 years ago. In the Gujarat region where they mostly settled, the Parsees have clung tightly to their distinctive culture and an austere set of religious values. Even today they observe a prohibition against polluting earth, air or water, and traditionally dispose of their dead by leaving the corpses atop high, wooden "Towers of Silence" to be eaten by vultures - although a worsening Indian vulture shortage, even in rural areas, has lately led to the embrace of alternative methods. Ratan's great-grandfather, Jamsetji Tata, having rejected the priesthood to pursue a career in commerce, founded the family business in the 1850s, and made his first fortune by peddling opium to the Chinese (a detail that goes conspicuously unmentioned in the Tata Group's otherwise comprehensive corporate history). The best answer, he decided, was to build a hotel of his own - one that would overwhelm its rivals in grandeur and opulence, and so was founded Bombay's Taj Mahal, still the country's most famous hotel, and still proudly owned by the Tatas. After Jametji's death, successive generations of the clan added airlines, car and truck companies and a bank to the portfolio, but India's business climate - particularly in the years after Independence - was rank with the governing class's predisposition towards socialist economic models, and every attempt to stimulate development and wealth-creation foundered. By the time Ratan became chairman in 1991 the Tata Group was in trouble. It had been asset-stripped by nationalisations, and battered by the high taxes and over-regulation that had, as a further consequence, driven millions of the best-educated and most enterprising Indians abroad. As a young man, Ratan seemed destined to join this diaspora. Certainly, he could see nothing to suggest that India would ever embrace real liberalisation, unleash the talents of its people and emerge as a great economic power. Although privileged, his childhood had been unhappy. His parents, Naval and Soonoo Tata, separated acrimoniously when he was seven, and with his younger brother, Jimmy, he was largely brought up by his redoubtable grandmother, Lady Navajbai. In a rare reference to these times Ratan told the American magazine Business Week: "She was very indulgent, but also quite strict in terms of discipline. We were very protected, although we didn't have many friends. I had to learn the piano, and played a lot of cricket." From these emotionally threadbare beginnings grew a man of ambitious but strikingly solitary nature. Ratan has never married, and for the last 20 years at least has lived alone in a modest, book-filled seafront house outside Bombay from where he drives himself to work each day in a small Tata car. His best friends are believed to be his dogs - he keeps several - and while enjoying quasi-celebrity status in India on a Bollywood scale, he is almost never seen at social functions. "There is a great sense of loneliness from time to time," he admitted, during last year's lengthy negotiations for the Corus deal, "I'd be lying or hypocritical if I said otherwise, but I have the dogs and they are a part of my life. After attending a private school in Bombay, he studied at Cornell and Harvard universities in the US, and - wowed by the dynamism and opportunities of American life - decided to stay on and accept a job with IBM. The more he looked over his shoulder at the ramshackle conglomerate, dominated by committees of family elders, that the Tata Group had become, the more sensible his decision seemed. Ratan's plans to escape the family firm were scuppered by his grandmother's ill-health. Consumed by a Zoroastrian sense of obligation, he returned to India, and by the mid-1960s was running the family's steel operations. He rose, steadily, although without fanfare, through the Tata hierarchy, finally becoming chairman - by a happy convergence of events - just at the moment that India finally accepted the virtues of the free market. The state's thumbs were prised off the economy's windpipe, the trade unions and regional bureaucrats effectively de-fanged, and the private sector allowed to compete right across the board. Now Ratan was in his element. Despite slimming the group down to 80 companies from more than 250, reducing the labour force by close to 40 per cent and selling off millions of dollars worth of non-core assets, he was able to point to rapidly rising profits and a far more modern, technological industrial base to build a future upon. So inescapable has the company become in its homeland that few Indians could imagine life without Tata. They spice their curries with Tata condiments, refresh themselves with Tata teas, dress in clothes made from Tata fabrics, drive Tata cars over bridges built with Tata steels, communicate through Tata telephone and internet networks, and stay in Tata hotels. Last year Ratan realised a long-held dream of producing an Indian "People's Car" costing little more than £1,200. It isn't enough. "Ratan Tata isn't satisfied," concluded Business Week. "He wants the world." Ratan N. Tata, chair of Tata group, was conferred with the degree of Honorary Doctor of Laws by the president and Board of Regents of Pepperdine University at a formal ceremony held in The Taj Mahal Palace, Mumbai, on Friday Sept. 3, 2010. He further added, “Mr. Ratan Tata’s accomplishments extend well beyond the corporate office to the community at large in India. Therefore, in recognition of your achievements and lifetime of service to your country, your business associates, your charitable concerns, and your family and friends, we in the Pepperdine Community are pleased and extremely honored to confer upon you this Honorary Doctor of Laws Degree. Mr. Tata has served as chair of Tata Sons, the holding company of the Tata group, since 1991. During his tenure, the group’s revenues have grown nearly 12-fold - $70.8 billion (around Rs325, 334 crore) in 2008-09. He presently sits on the advisory boards of several international corporations that includes Mitsubishi, Rolls Royce, and the Monetary Authority of Singapore and also serves as a director of Fiat and Alcoa. He chairs two of the largest philanthropic trusts in India (Sir Ratan Tata trust and Sir Dorabji Tata trust) and holds leadership positions in many charitable and national service institutions, such as the Prime Minister’s Council on Trade and Industry and the Court of the Indian Institute of Science. He is also active in Global Business Council and The Bill and Melinda Gates Foundation’s India for HIV/AIDS initiatives. Mr. Tata is a graduate of Cornell University and has completed the Advanced Management Program at the Harvard Business School. He has also been conferred an honorary doctorate in Business Administration by Ohio State University; an honorary doctorate in Technology by the Asian Institute of Technology, Bangkok; an honorary doctorate in Science by the University of Warwick; and an honorary fellowship by the London School of Economics. In 2008, the Government of India honored Mr. Tata with its second-highest civilian award, the Padma Vibhushan.